Mortgage interest. I read with bemusement some time ago that around one in six landlords is failing to claim mortgage interest when completing a tax return. Seeing as this is probably the largest expense that a landlord will have to suffer this came as rather a surprise especially given the prevalence of interest only mortgages among buy to let landlords. So don’t forget to claim the interest on the mortgage connected to the rental property. Note that it’s only the interest that’s allowable so if you have a repayment mortgage then it’s only the interest element of it – not the capital repayment – that you can claim as an expense. It’s also worth noting that if you look out a loan, maybe to raise the deposit for the property, then the interest on that loan is allowable. Also the interest on any credit card borrowing for the property should be claimed as well. Travel expenses. Imagine if the property that you’re renting is right across town, or in a different town, or at the other end of the country or even in a different country. Travel expenses to the property to carry out repairs, deal with tenants etc. should definitely be claimed. It’s not just travel expenses to and from the property – don’t forget trips to the DIY shop to buy materials for repairs on the property, trips to your accountant or bank manager in respect of the property, an overnight hotel stay because of the property you’re renting is in Yorkshire when you live in London! These are all business expenses and should be claimed. Please bear in mind though that these expenses must be solely for the purpose of the letting business. So if you go to visit relatives and on the way decide to stop at your rental property then this journey has a dual purpose and so can’t be claimed. Repairs and maintenance. The cost of any repairs or maintenance that you carry out on the property should be claimed. Costs can range from picking up a few bits at the local DIY store to the cost of a plumber to come and fix a leaking radiator. If you have a gardener that goes in to keep the weeds under control or a cleaner who goes in weekly these should be claimed as well. A word of caution. Be sure that the repairs that you’re carrying out are not improvements. If a tenant sets fire to a chip pan and as a result the kitchen needs to be redecorated then this is a repair and therefore fully claimable. If, however, you decide that the kitchen in one of your properties is looking a bit tatty so you rip it out and put in a new one, this is an improvement, not a repair, and so cannot be claimed. Improvements are generally capital in nature and therefore only relevant for calculating capital gains tax if you come to sell the property. Insurance. Any insurance that you take out in respect of the property or the property business should be claimed. This will include buildings and contents insurance, public liability insurance, rent guarantee insurance. Employer’s liability if you employ someone to deal with your properties. Also don’t forget things like emergency breakdown cover or maintenance contracts. Utilities payments. If you have a void period utility bills may still have to be paid so things like gas, electricity, water or even council tax should be claimed if you’ve had to pay for them. If the property is a flat or a leasehold property don’t forget ground rents and service charges. Professional fees. 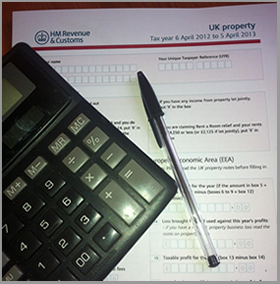 You may employ an accountant to deal with your taxes or a solicitor to deal with tenancy agreements etc. These costs are allowable and should be claimed. Also be sure to include estate agents fees, letting and management fees as well. Wages. If you employ somebody to manage your property then that person’s wages can be claimed as an expense. It’s worth bearing this in mind if you have a non-working spouse as you can employ them to manage the property. Don’t forget that that your spouse will be subject to the PAYE regulations the same as any other employee. Advertising. If you pay an estate agent to advertise your property or put an ad in your local paper or even if you just pay to put an ad in Gumtree these are all advertising costs and should be claimed. 10% wear and tear allowance. If the property is fully furnished you can deduct 10% of the rental income as a wear and tear allowance. This deduction is intended to cover the cost of repairing and replacing furnishings, white goods and other items such as a TV if you provide one. Note that for HMRC fully furnished means just that, i.e. fully furnished. Your tenants should just be able to move in with a suitcase full of clothes and have no need to bring anything else. Gas and electricity safety certificates. The law requires that these certificates be renewed annually so the cost of the certificate plus the associated tradesman’s costs should be claimed. Other incidental expenses. In short, any expenses that you incur in relation to your property business should be claimed so don’t forget items such as stationery, bank charges, subscriptions to property magazines, landlords computer software, costs for landlords courses or conferences, etc. Losses. This is an area that is often ignored, especially when landlords switch accountants. If you’ve made losses on your rental property then these losses can be carried forward and used to offset future profits. Losses can accumulate so if you make a loss of (say) £3,000 in year 1, £1,000 in year 2 and £500 in year 3, when you make a profit of £6,000 in year 4 you can offset the £4,500 of accumulated losses so you’ll only be taxed on £1,500. Finally, it’s worth remembering that if you and your spouse own a rental property jointly then the income and expenses will be split 50:50 no matter what the actual proportion of ownership. It is possible, however, to make an election so that the split of profits mirrors the legal ownership of the property. Even if the property is held in equal shares it’s possible to make an election that profits be allocated in unequal shares. Again, this is useful if you have a spouse with no other income or ina lower tax band. You will need a solicitor to draw up the paperwork and HMRC will need to agree the election but this can provide substantial tax savings if you are a high earner and your properties generate significant profits.